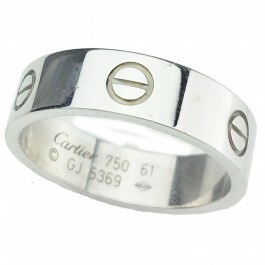 Iconic Cartier love screw ring in 750/18k White Gold. Band is the wider one at 6mm. Size 61 or US 9.5 Great pre owned condition. Shows light wear as seen in pictures. 100% authentic as are all our items. The story of Cartier starts off in Paris France when Louis-Francois Cartier took over his mentors workshop in 1847. His son Alfred started to gain notoriety for his pieces and his two sons expanded the brand worldwide by attracting Aristocrats and the world's elite. In 1899, Cartier moved its boutique to the world famous Rue de la Paix in Paris. The company soon added flagship locations in New York and London. Cartier products include watches, leather goods and accessories.